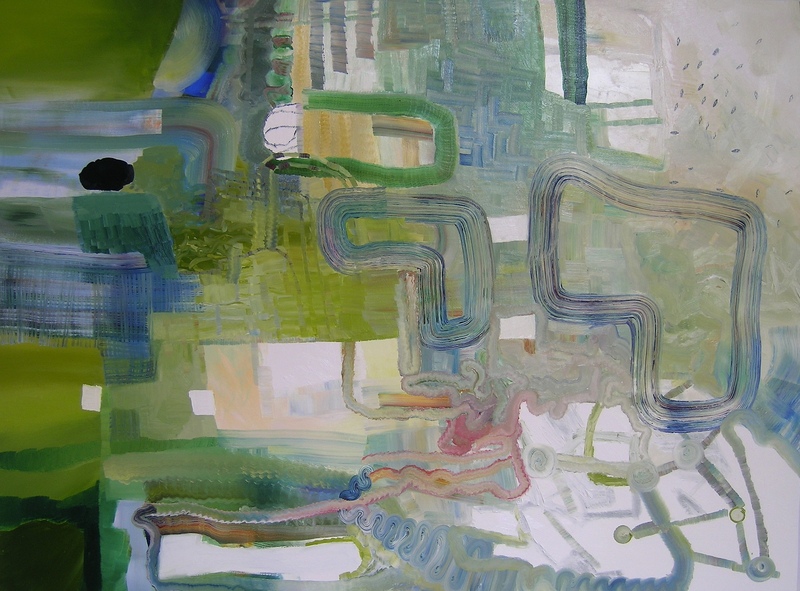 Consider Josette Urso’s paintings a gathering of environmental explorations. They present us with a complicated mix of layers that are sometimes light and airy, other times heavy in thickness. Across pieces like Button Up and Crest , one might read spidery gestures and watery, weather-like patterns. In the backdrop of all her works we find the pleasing essence of candy colors and trinket shapes. The poetry of Josette’s pieces emerges when bursts of cartoonish playfulness arise out of her delicate abstraction (i.e. Snow Here/Snow There and Snow Kit). Though the paintings have titles that ground us, Josette’s art keeps us wondering about the landscapes from which each painting came. Josette Urso, a two-person exhibition with Joan Grubin, Location/Dislocation: Re-Imagining Space is on view at the New York Institute of Technology until March 19, 2012. She is a Brooklyn-based artist and has shown at the Bronx Museum, the Drawing Center, and the New York Public Library, among other institutions.